I keep getting queries because of my site Dementia Care Notes, and the most frequently asked questions by my site visitors are related to getting trained attendants for dementia home care, or getting information on old age homes where dementia patients can be admitted. My website already contains information on these, but I think people want to hope, and when they are desperate, they want a personal and direct answer. Much of my correspondence time goes in personalized replies to such queries, but I thought I’d put together a sort of summary answer here, anyway. First, old age homes for dementia patients. As per the Dementia India Report 2010, there are an estimated 37 lakh (3.7 million) dementia patients in India and 6 respite care facilities (facilities for fulltime stay, short term or long term) that are specialized for dementia patients. I’ve summarized some data alongside, and you can see the contact information for all six at my website’s resource page here: Dementia Caregiver Resources across India. 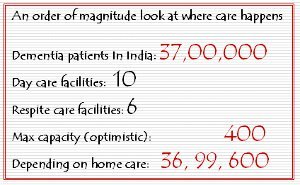 Add to it the day care facilities, the optimistic estimate of capacity oriented for care suitable for dementia patients is 400. Four hundred, across India, a nation where the number of estimated patients is 3.7 million. Below are some observations I have to add on this topic–these are, of course, my observations, not an authoritative report, but they are based on multiple data points, and I welcome comments that may improve this understanding.